ARCHANGELS is a company based in God's Country (beautiful sunny Southern California), dealing in Rare and Unique Paper Collectibles. We specialize in vintage Comic Books, Original Comic Book Artwork, Hollywood Movie Posters and other related items as well. We are Senior Advisors to the Overstreet Comic Book Price Guide and a Charter Member Dealer with the Comics Guaranty, LLC (CGC). For other wonderful items, make sure to visit us at our About Me Page. Action Comics #600 Art by John Byrne and George Perez. Original artwork for Action Comics #600 (DC, 1988), which commemorates the Golden 50th Year Anniversary of Superman in the pages of his anthology title. 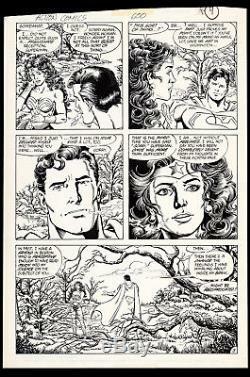 This story, "Different Worlds" begins with an alluring scene of Superman and Wonder Woman exploring the initial stages of their romantic relationship. Superman, idealistic and boyishly love struck, has a frank heart-to-heart explorative conversation with Wonder Woman about their budding relationship, who raises a more sane, more contemplative and mature outlook on the pressing matter. Art rendered by such titan talents as John Byrne (pencils) and George Perez (pencils and inks). With great images of both heroes and heavy on tense reciprocal chemistry, the piece is quite special due to Byrne's cinematic layouts and Perez's vintage delicate and detailed finishes. A classic in every aspect of two of the most famous and beloved heroes in all comic history by two of the most celebrated artists to ever grace the medium. Art is in excellent condition with image size measuring 10 x 15. The item "Action Comics #600 Art John Byrne George Perez Superman Romances Wonder Woman" is in sale since Thursday, April 5, 2018. This item is in the category "Collectibles\Comics\Original Comic Art\Interior Pages". The seller is "water-walker" and is located in San Diego, California. This item can be shipped to North, South, or Latin America, all countries in Europe, Japan, Australia.